Chipotle aioli adds a zesty touch to this sandwich, made with toasted whole grain bread, lettuce, turkey, avocados, onions and cheese. Spread toast slices with aioli. Fill with remaining ingredients to make sandwich. For more color and crunch, add thin red pepper rings to sandwich filling. 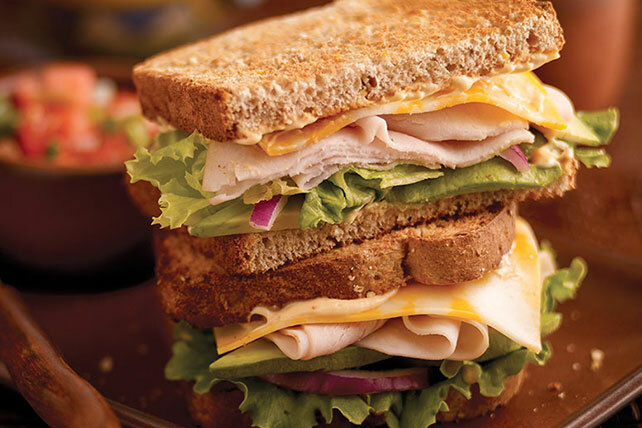 Prepare using OSCAR MAYER Natural Applewood Smoked Turkey Breast and a KRAFT Slim Cut Sharp Cheddar Cheese Slice.